Today’s post is Part 3 in my series that began on May 16, 2018 concerning the recently concluded exhibition of extraordinary egg tempera paintings by Fra Angelico. 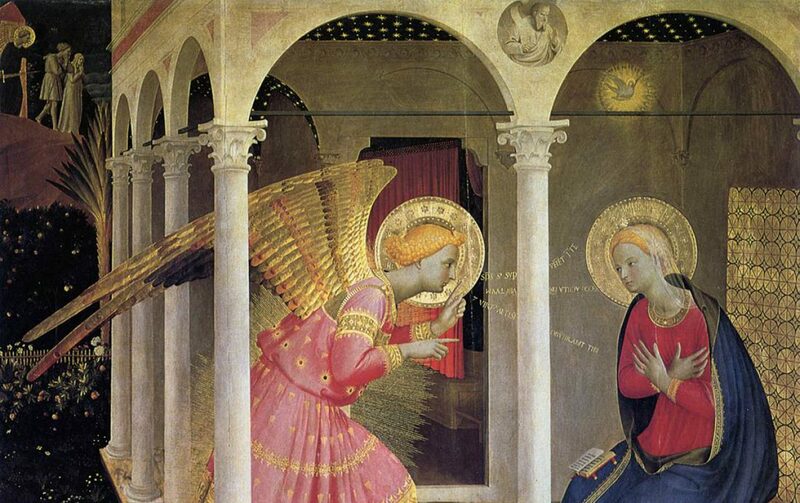 The exhibition was held at the Isabella Stewart Gardner Museum in Boston, Massachusetts and entitled Fra Angelico – Heaven on Earth. Today’s painting concerns a major piece of the exhibition – the Armadio degli Argenti. The four panels of which the Gardner Museum only showed one is also known as the “Silver Chest.” It was commissioned in 1450 and completed in 1452, three years before Fra Angelico’s death. This panel (123 x 160 cm) includes eleven compartments: The Road to Calvary, The Disrobing of Christ, The Crucifixion of Christ, the Entombment of Christ, The Descent into Limbo, The Three Marys at Christ’s Tomb, The Ascension of Christ, Pentecost, The Last Judgment, The Coronation of the Virgin, and the Lex Amoris (Law of Love). The panel is seen below. This panel is one of four that decorated a large cupboard-like chest. The chest contained highly valuable silver votive offerings that were donated by the faithful of Florence to the Church of Santissima Annunziata. Their donations were in honor of a miracle working fresco of the Annunciation of Mary in a side chapel of that church. The entire chest was commissioned by Piero di Cosimo de’Medici during the church’s restoration. The paintings within the thirty-six “compartments” are painted in egg tempera and gold on a wood panel (The Last Judgement occupies two compartments). In 1782, the panels were separated from the chest in, thankfully, an unsuccessful attempt to sell them. In 1812 they began their journey to the Galleria dell’Academia, and finally to their current resting place – the Museo di San Marco. Some close-ups of the panel are found below. The “compartment” above was entitled Lex Amoris (Law of Love) by Fra Angelico. It shows a menorah covered with scrolls on which are written items relating to the New and Old Law, and emphasizing the New Law as superior. The scrolls specifically relate to the Sacraments of the Church and specifics of the faith. We also see the twelve Apostles and the twelve Hebrew prophets on each side of the menorah showing that they are all connected through the holy Cross of Christ (top center with red and white standard). The purpose of this panel is to explain that in the coming of Jesus Christ you see the fulfillment of the Biblical prophecy of the Messiah, which does not stand alone, but is related to other events in Jewish history. Notice the female in the lower left corner holding a shield which proclaims “Lex Amoris” (Law of Love) versus the Jewish tradition of “Lex Timoris” (Law of Fear). In her right hand she holds an open book. A beautiful allegory of faith that is beautifully executed by Fra Angelico. The above photo is one of the thirty-six panels describing events of the New Testament, in this case the Coming of the Holy Spirit at Pentecost. Notice Jesus’ mother Mary at the top center of the image with the Apostles and disciples (Peter is on her top right, and John is on her top left). They are receiving the Gifts and Fruits of the Holy Spirit symbolized by the tongues of fire. A curious crowd gathers below the upper room as described in the Acts of the Apostles. This is a close-up photo of one of panels in the Armadio degli Argenti in this case showing part of the image of the Last Judgment. Notice one of the angels dragging a sinner from the right side of Christ, the abode of the saved – to the left side of Christ, the abode of the damned prior to their being cast into hell. The beautiful book, published in union with the Gardner Exhibition, Fra Angelico – Heaven on Earth – was edited by Nathaniel Silver and published in 2018 (Boston, London). It was extremely helpful (pages 210 – 215) in my commentary. Today, May 1, is the memorial of St. Joseph the Worker. I chose him to be the patron of St. Joseph’s Art Workshop (found within this site’s Menu Tab at the top of the page) because he is, of all the saints, the most important next to Our Blessed Mother. He was a righteous man (in the finest sense of that spiritual word), a devout and very prayerful Jew, a carpenter, the beloved spouse of our Blessed Mother, and the foster father of Jesus Christ. Today we honor him as a worker. A worker in the professional sense and a worker in God’s vineyard. Saint Joseph provides us with a model for some of the attributes that all Catholic artists should cultivate: the proper use of time, patience in learning the techniques and meaning of our work, and the daily work itself – making a prayerful commitment to find some time during the day to learn something new about sacred art and practicing the skills necessary for its proper construction. You will find below a few of the phrases, prayers, and Scripture readings from today’s Divine Office (the Liturgy of the Hours) for the memorial of St. Joseph the Worker. Come let us worship Christ the Lord who was honored to be known as the son of a carpenter. God made him the master of His household, alleluia, alleluia. He gave him charge over all His possessions. Saint Joseph faithfully practiced the carpenter’s trade. He is a shining example for all workers, alleluia. A reading from the letter of Paul to the Colossians (3: 23-24): Whatever you do, work at it with your whole being. Do it for the Lord rather than for men, since you know full well you will receive an inheritance from Him as your reward. Be slaves of Christ the Lord. All-holy Father, you revealed to Saint Joseph Your eternal plan of salvation in Christ, deepen our understanding of Your Son, true God and true man. God of all righteousness, You want us all to be like You, may Saint Joseph inspire us to walk always in Your way of holiness. Saint Joseph, please pray for us now and at the hour of our death. Amen.